The yellow pickles must be very delicious, but too bad.. i have to hold myself for eating sour and spicy foods.hiks.. 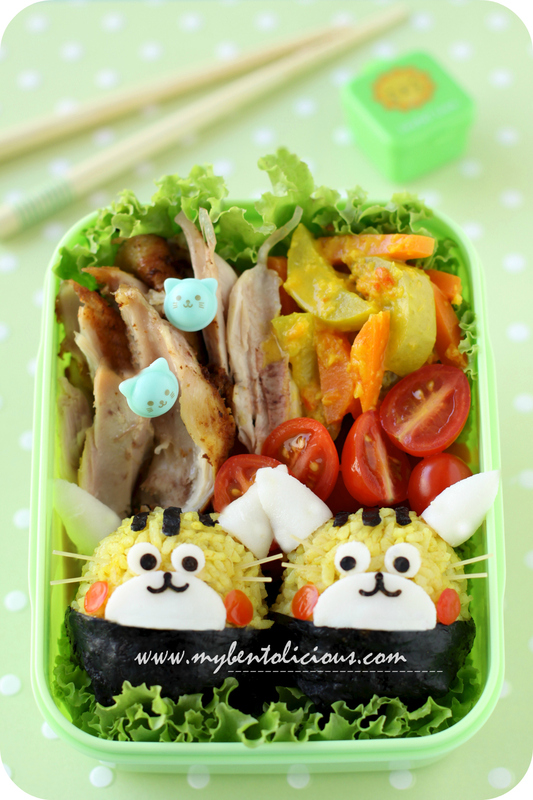 The overall bento looks adorable and yummy. As usual, I love it! the cats look happy and delicious too..
wow...so nicely deco Lia, normally how long did u spent for those bentos? Lia, Happy Belated Birthday! Trust you have had a great birthday celebration. The cats look cute. I love your bentos. They're wonderful indeed. Hi Lia, I've been following your bento blogs for a while. Your bentos are so cute!!! Love them!! I'm just wondering if you would mind posting the recipe for the turmeric rice and the indonesian yellow pickles? I love those but don't know how to cook them! I live all the way in Canada so I really miss some of the asian food back home. Cute pair of cats...I thought of tiger when first saw the photo..hehhe. @Emily Ng : hehehe ... Cat and tiger are so close :D Thanks a lot Emily!